"I have no greater joy than to hear that my children walk in the truth"
2018 was the first year of the empty nest syndrome for Salam and Daoud. While Dina spends summers and Christmas in Amman (and we even saw her briefly in Palestine during her school trip in October), we are slowly getting adjusted to an empty house most of the year. This hasn't meant that we have been complacent. Salam has been busy with the Senior Citizens home project (Beit El Hikmeh) with the church group along with other responsibilities at the Baptist church. Daoud cut back on his travel in 2018. He only visited Vienna, Bratislava (Slovakia), Doha, New York, Chicago, Philadelphia, Tunis, London, Cairo, Jerusalem and Ramallah. Daoud's book Sesame Street, Palestine is finally published by Bear Manor Media. The possibility that it might be converted into a movie is being discussed with a New York film producer who has bought the initial film rights. A special visitor at Daoud's work ushered in a much better year at the Community Media Network. We were honored to have Queen Noor visit us, and Dina was able to meet with her privately and hear her Princeton stories (since the Queen is a Princeton alum). 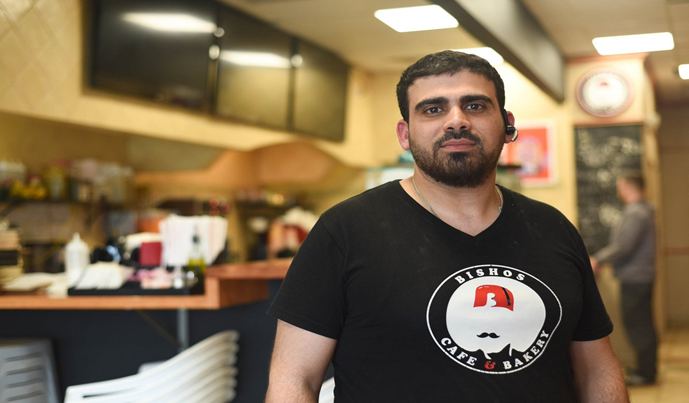 Bishara has been busy with his Philadelphia area restaurant Bishos Middle Eastern Cuisine in Roosevelt Mall (if you live in the Philadelphia area stop by or get them to cater to your events). During immigrant month Bishara hosted the mayor of Philadelphia Jim Kenny and introduced him to kenafeh. Bishara got some marketing help this year from Salam's nephew Layth Madanat who just graduated with a Master's degree in international business from Regent University. 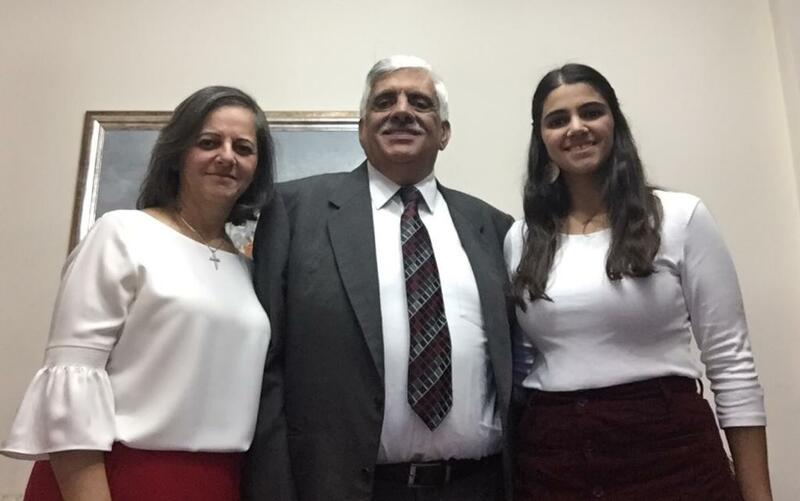 While Salam was busy creating the best thanksgiving dinner possible both in Ramallah and Amman, Dina, Bishara and Layth drove to Ohio to spend time with aunt Lydia and family. Dina also brought along a friend from college and enjoyed introducing her to the family and many of our traditions. Dina is now taking driving lessons so that next time she can help in the long drives. Dina is currently in her sophomore year at Princeton and has settled in nicely. She is particularly thankful for the great friends she has made and the communities she is a part of. She finds her classes both interesting and challenging, and has developed a passion for Middle East studies, which was heightened by a class trip she took to Palestine & Israel. Outside of class, she is keeping herself busy with various extracurricular activities, while also making time to travel and visit family. Some of the highlights of her year were: introducing her cousin Katie Madanat to the US and taking her around Princeton, voting for the first time in the midterm elections, and going to a Broadway show. She is happy to be back in Amman for Christmas, where she is relaxing, catching up with family and friends, and enjoying Salam's food. 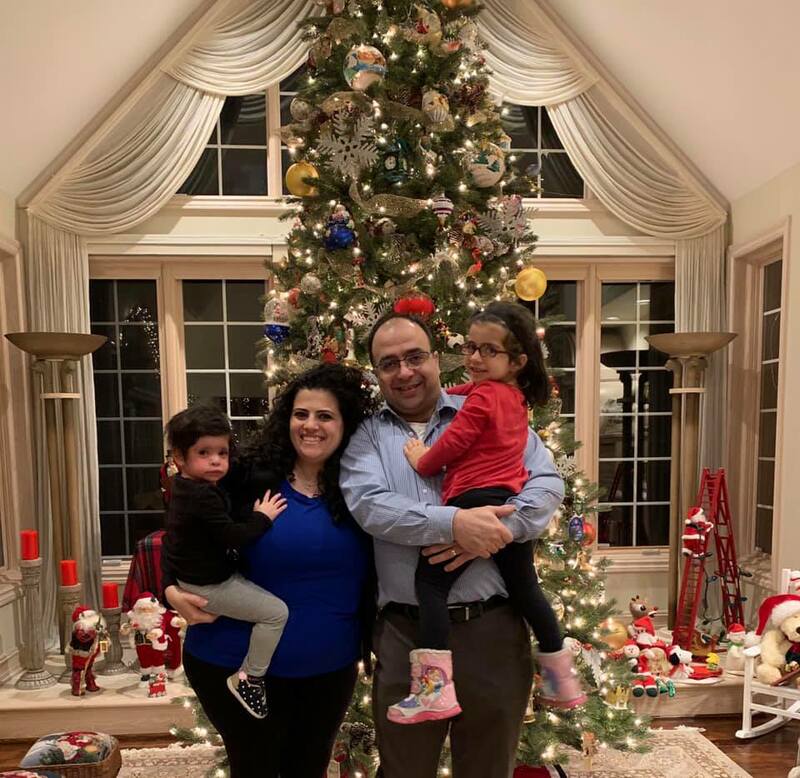 During Thanksgiving, Tamara, Alaa, Yasmeen and Dalia drove to Ohio from Chicago along with Alaa’s parents who have been spending time visiting with Alaa, Tamara, and the girls. Alaa graduated with a Master's in Biblical Archeology from Wheaton College in May. Dalia turned two in August and is growing up to be a sweet, strong, and smart little sister. She loves to pretend play with Yasmeen and anyone visiting by serving them eggs to “eat.” Dalia is still going on her many regular hospital visits in downtown Chicago. Dalia and Yasmeen have become best friends as they’ve been spending so much time together at home and with their Qasasfa grandparents. Yasmeen who is growing up quickly is now four and is very kind and helpful to her parents and Dalia. While at DayCare Yasmeen has been taking a special course in phonics and is learning how to read and write. She is also particularly amazing in putting complex puzzles together. Her all-time favorite thing to do with Dalia is to “mother” her around. Tamara has gotten a promotion at the daycare she works at and is now the Assistant Director at the Wheaton KinderCare. Alaa and Tamara had to move after their great offer at the home of a missionary family ended and are enjoying their new spacious apartment. Salam will be going to Chicago and spending a month with them in Spring 2019. 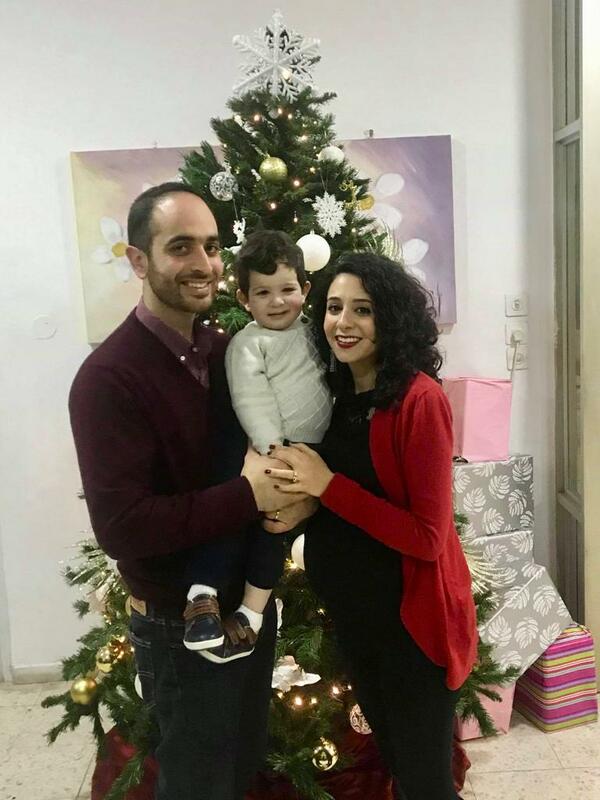 Tania and Samuel's highlight this year was finding a house they can own in Kufr Aqab (near Ramallah) instead of living in rented apartments. They were busy fixing it up for a few months before moving in last month, and were happy to have Salam and Daoud (mostly Salam) help them with the move. Daoud and Salam also bought a small apartment in the same building. Saleem is getting older and is even more active. He is smart and full of energy which is hard to keep up with, especially since his mom is also expecting a second boy sometime in early 2019. Tania is still working as a Project Manager at Souktel, an IT startup, managing the tech component of USAID projects globally. Samuel is playing a lead role in running the family produce business in downtown Ramallah. Salam lost two uncles this year. Wahdan Oweis, her maternal uncle and the family's patriarch, passed away on November 2nd. A month later Fahed Madanat, her paternal uncle, passed away in Karak. Jabra Tanous (Abu Ayman), husband of Salam's aunt Labibeh, also passed away this past winter. 2019 will be the last year we will live in our Rabia home in Amman. We will be moving in July of 2019, and although we are sorry to say goodbye to a house that means so much to us and that we have lived in since Dina's birth in 1999, we are excited for a new chapter ahead.